history of how women got the right to vote; one is the fact that the deciding vote was cast in Tennessee by Harry Burns and two, he voted in favor of the votes for women on the advice of his mother Febb Burns who sent him a telegram hours before the vote admonishing him to do the right thing. 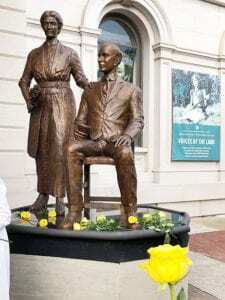 On Saturday, June 9th, after years of planning and fund raising, a statue was unveiled in Knoxville celebrating the mother and son and their contribution to the passing of the 19th that forever changed the nation. 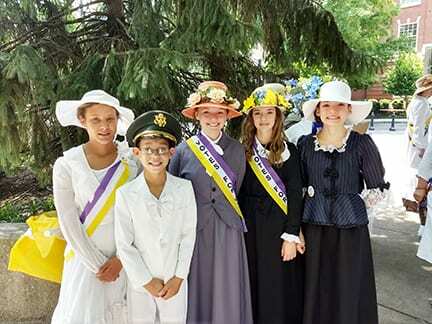 In celebration of the unveiling, the Suffrage Coalition of Knoxville, under the direction of chair and historian Wanda Sobeski, held two days of celebration leading up to the event. where author Elaine Weiss signed copies of her book The Woman’s Hour. The student winners of the video contest about the fight for women’s voting rights were also presented. 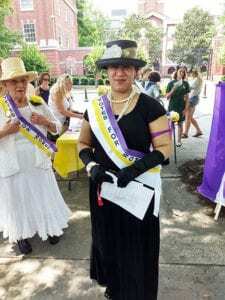 Saturday afternoon, hundreds of women, children, and men, many dressed in white and other historical costumes marched in a parade thru downtown Knoxville to the statue site in remembrance of the original parade that was held demanding the voting right in 1913.